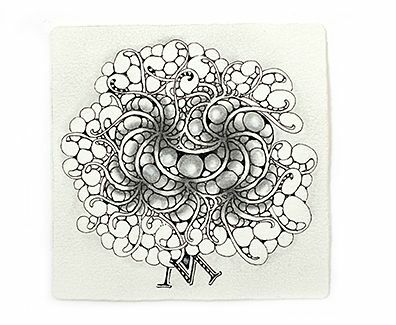 Zentangle Newsletter - New Tangle--Molygon (and more)! A New Year and a . . .
. . . and more fun treats. As I was working on refining this new tangle, I looked up the definition of a polygon, "a plane figure with at least 3 (straight) sides and angles, usually more than 4." I immediately got very excited that I had invented the first ever 2-sided polygon. Of course, you must ignore the part about the straight lines and angles! But then again, I can't draw a straight line. ( I love geometry, so this has been a bit of a problem for me.) Then I looked at the bright side (as I usually do) and figured this has served me well. But what to name this new tangle? Molly had just left the house. I was sitting in our kitchen talking with Martha and trying to come up with a catchy name. We heard Rick bounding down the stairs. He burst into the kitchen and asked, "Molly gone?" "Mum, that's it!" Martha shouted out with glee. "Molygon, the name for your new tangle is molygon!" Molygon offers a new kind of grid, a shape to fill with the beautiful and simple, or the complex and wild . . . tipple, knightsbridge, stripings, perfs, crescent moon, or anything your hearts desire. Note that when you aura the first stroke of an adjacent molygon, that aura is usually about a half the length of the outer curve of the previous molygon. 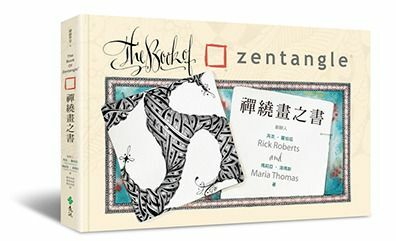 When Maria and I were in Taiwan and Malaysia on a book signing tour for the Chinese version of The Book of Zentangle . . .
. . . we gave the local CZTs a sneak preview of molygon. 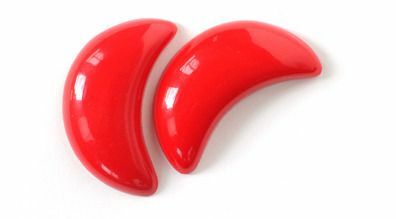 The next day one of the local CZTs brought in a pair of red molygon shapes called jiaobei (筊杯). They use them as a way of "answering" yes/no questions. We had lots of fun using them when we did give-aways at our lectures and book-signings. You can see why molygon reminded them of these. Christmas day, Maria and I went to Martha's home. While there, we went to the beach. It was a warm day, in the 60s (my grandson and I went swimming!). 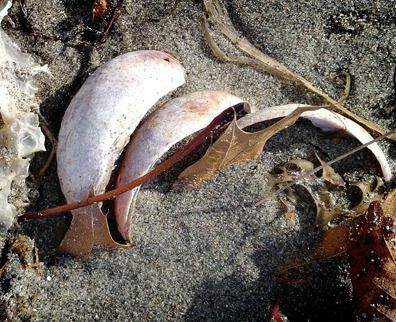 As we walked along the beach I saw all these shells, called boat shells. 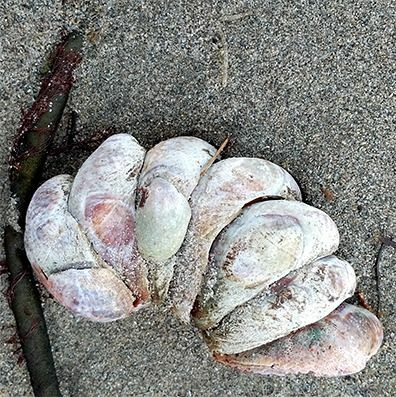 They would gather, one attached to the other, to maintain a seal when the tide went out (or so I imagine). Often they had a gap much like molygon and when I'd get close to take a picture they would "clam-up" and look like bunzo! Usually we notice patterns that inspire tangles. This Christmas, a tangle inspired an awareness of patterns I might not have noticed. We look forward to soon seeing what you create with molygon. After all this Bijou talk this busy time of year, we thought it would be a perfect time to introduce our new Black Bijou Tiles. With all the fun we have been having with the white Bijou tiles it only made sense to explore making them in black. 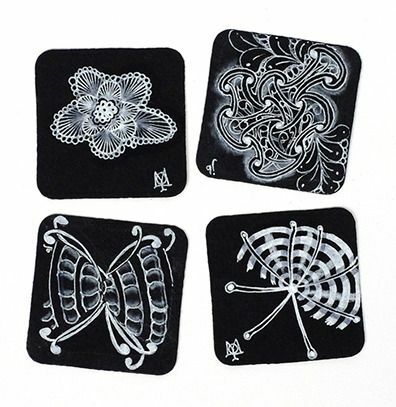 A tin full contains approximately 55, 2x2 inch black tiles using the same luscious 100% cotton paper as our Original Zentangle black tiles. We say approximately, because Bijou insisted on helping with production and it's easier for him to measure how high a stack is, instead of counting each tile one by one. 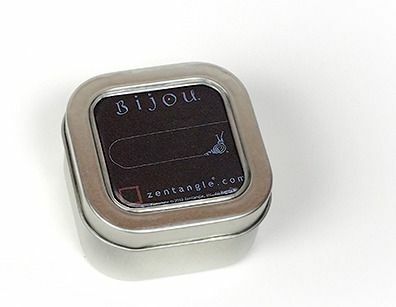 Also included in the tin are 3 random bijouisms (We never know which ones Bijou includes) and a lighthearted and heartwarming introduction to Bijou. Tiles come in a little jewel box with a window lid so you can see Bijou or your favorite tile of the day. 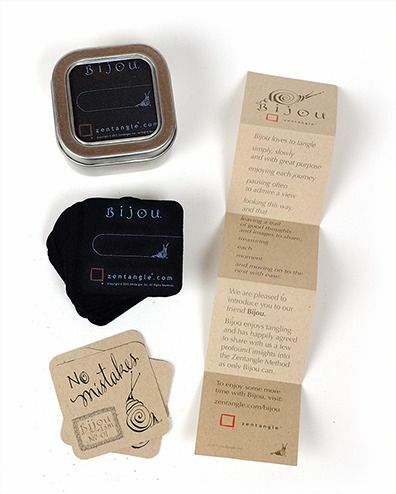 Bijou tiles are perfect for monotangles and organizing your tiles and tangleations. 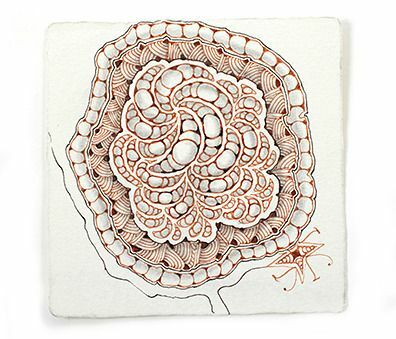 This will be a class taught by Rick and Maria for people with previous Zentangle experience or general knowledge of the Zentangle Method. 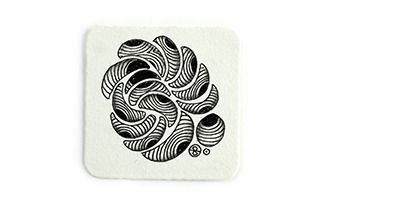 Allow each pen stroke to guide you toward the next on this Zentangle journey beyond the basics. 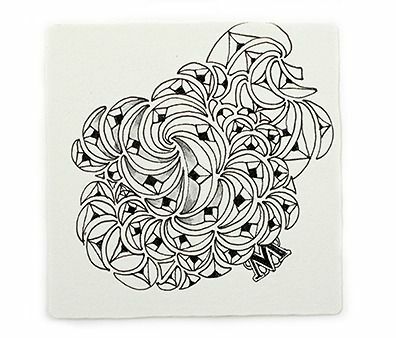 Using the fundamental steps of the Zentangle Method, explore tangles you may already be familiar with, discover new ones, and take your creations to a new level of fluidity. 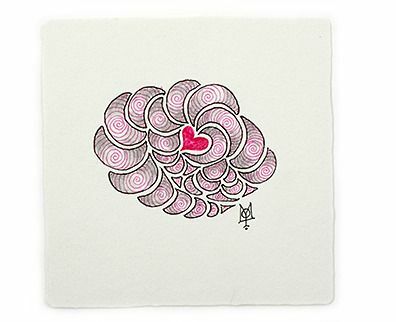 The making of beautiful, free-flowing, Zentangle art. 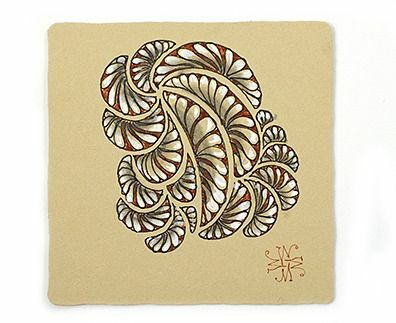 Designed for everyone already enjoying this meditative form of artistic expression, this program lets your Zentangle practice flourish and go even deeper, one tangle at a time. Join us a Kripalu Center for Yoga and Health in the Berkshires of western Massachusetts with Rick, Maria, Molly and Martha. I always record Good Morning America to watch later in the week. I was watching last Sunday's episode this morning and between two of the segments, where they always show a sun graphic of some kind, there was a Zentangle sun! 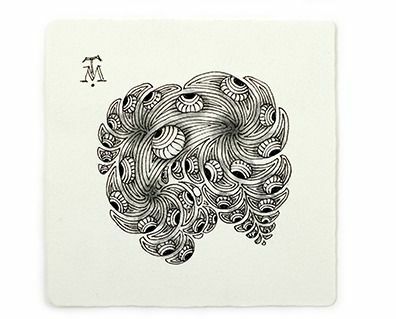 I'm sure it was one they received in our Zentangle barrage a while back encouraging them to do a Zentangle story. Thank you very mutch for the newsletters, for all the information on the Internet and for the happiness that brought Zentangle into my live. I'm looking forward to meet you and all the "Zentanglelovers" in April at the CZT seminar. I 'm drawing almost every day and it feels good. 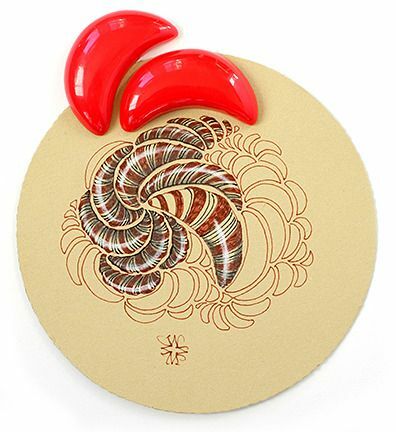 For the Christmas table, I've made a Zendala tile and attached it under a dish in glass, it is easier for me than drawing on the dish. After the dinner, the guests may take the dish home as a Christmas present. 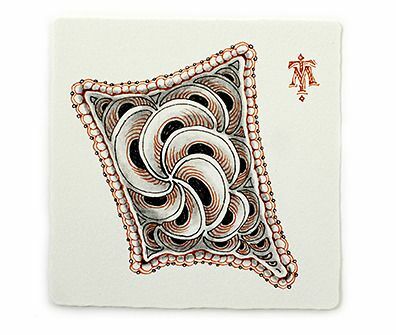 I was finally able to get into San Quentin to teach Zentangle to 2 groups of men. There is quite a bit of mental illness in the prison. I was informed after our first class (which had 8 men in it) that one of the guys who continually falls asleep in groups due to being heavily medicated that he was able to stay awake in the next group the following week because he was tangling! I'm going in again on December 23rd so, I'll get to talk to him about it. In the second group I did that day, there was 21 men all in a big circle. We had no tables so they held the tile either in their hand or on their lap. Since the supplies I was able to take in were limited (they loved the quality of the tools! ), I used a white board to show them the three basic tangles. Once again, they loved it and I was invited back!! I'm going to have to figure out a way to make it more comfortable for them to draw their tangles. I wish I could have taken pictures! It's because of your generosity that I've been able to do this for them and they are so appreciative. Thank you so much!! I'll keep you posted on future events. Thank you also for sharing this Zentangle adventure with us and with others.